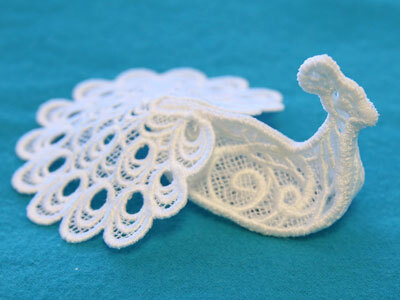 A 3D lace peacock with a long, sweeping tail makes an elegant home decoration, filled with graceful swirls. Hang as an ornament from your tree, or use to add a stylish look to mantels and tabletops. 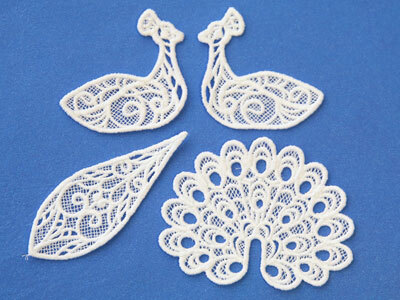 the lace peacock are below. When you download the design, you will find a total of 4 files. The files labeled with the letters "a" and "b" are the two sides of the peacock. 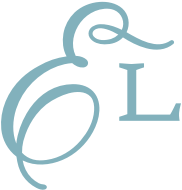 The file labeled with the letter "c" is the peacock's belly, and the file labeled with a "d" is the tail. 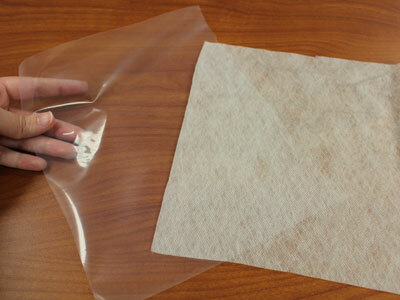 There are a couple of different kinds of water-soluble stabilizer. One is clear and plastic, and that brand is Sulky Ultra Solvy. The other is soft and fibrous, called Vilene. Both will work very well. Vilene is used in this demonstration. 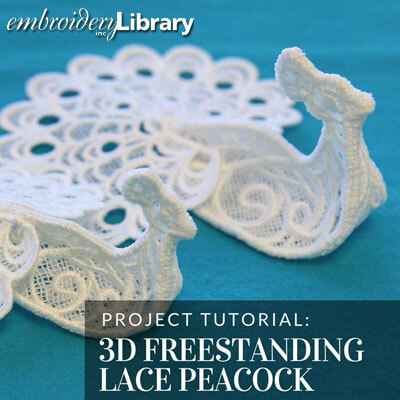 Load the first file (piece a) onto your machine. 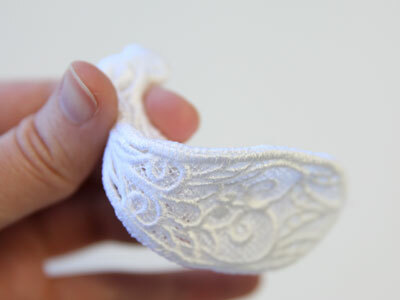 Use 40 weight rayon or polyester thread. 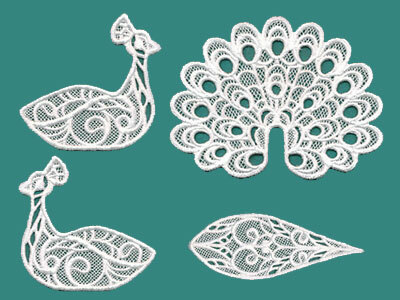 You can also use 30 weight cotton or metallic thread for most freestanding lace designs. 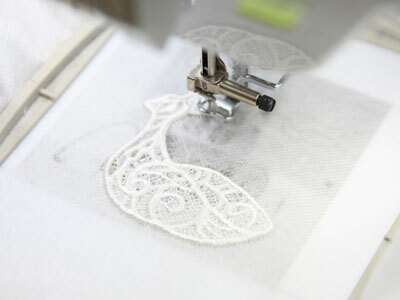 Repeat the steps above to embroider the other three lace pieces (b, c, d). 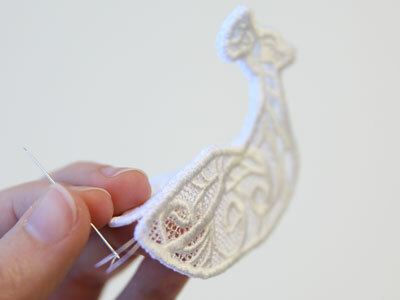 You can also starch the side and belly pieces flat before assembling to make a studier peacock. 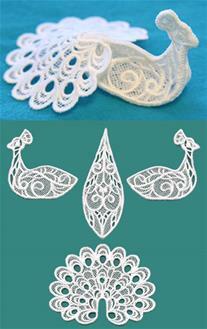 Take the two side pieces of the peacock (a, b), and hold them together, wrong sides together. Starting at the underside of the beak where it meets the neck, start to hand sew the two pieces together. 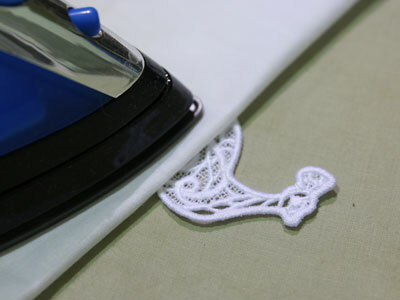 Make sure to hold them securely while sewing so that the two pieces stay lined up with each other. 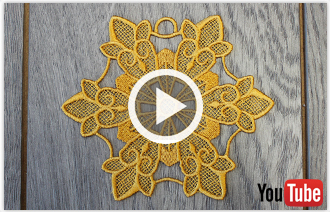 Use the same thread as used in the embroidery. 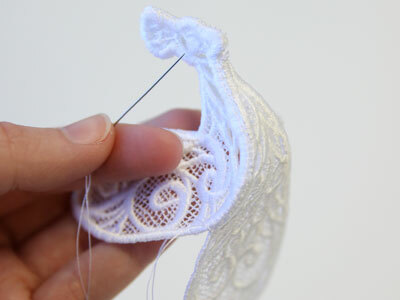 Continue sewing until you get to the point at the back of the lace peacock. 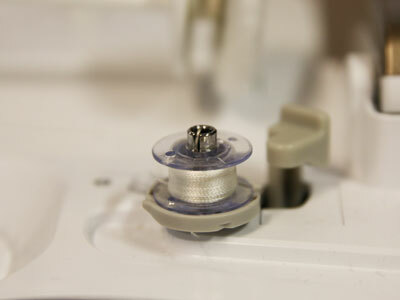 Tie off, and thread the needle with a new length of thread. 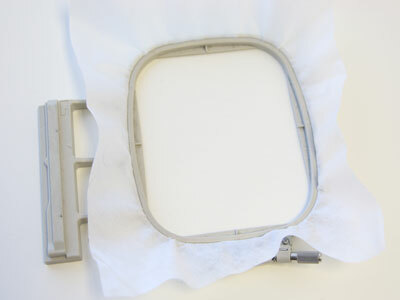 Next take the belly piece (c) and line one side up with the bottom edge of one side as shown. 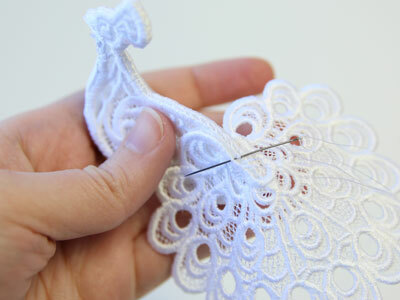 Make sure the right side of the lace is on the outside of the peacock, and hand sew starting from under the beak to the point at the back of the lace peacock. Tie off the thread. Sew the opposite side of the belly to the other side. Again, make sure to start sewing from the beak and move towards the back of the bird. 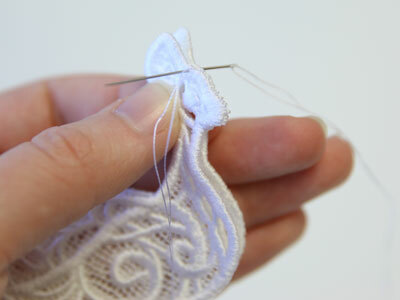 Always going in this direction will help to make sure all the lace pieces line up well as you sew. 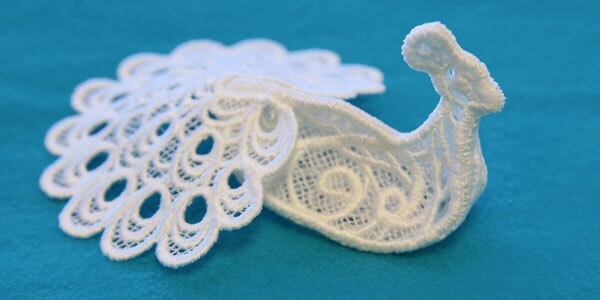 Finally, take the tail lace piece (d), and place the notch over the back of the lace peacock, right side facing upwards. 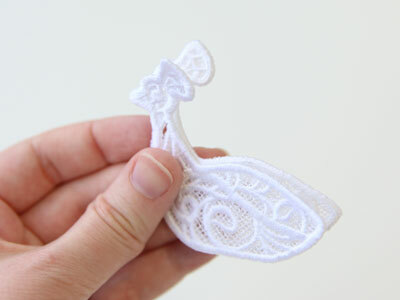 Carefully tack it into place with a hand sewing needle, making sure it lines up in the same place on both sides of the bird. 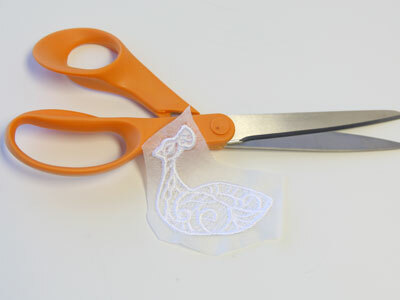 Sew the tail in place using a hand sewing needle and thread.